Most of the tarps we sell at Mytee Products are intended for use by truck drivers looking to protect the cargo they transport. Yet, we also carry a couple of other kinds of tarps as well. Among them are shade mesh tarps available in black and green. Construction companies often use shade tarps to create privacy screening around building sites. As a truck driver and homeowner, you could use shade tarps around the house for several reasons. In this post, we will describe three ways to install shade tarps for temporary use. In every case, the point is to provide a level of shade. Installations are temporary in nature because the idea is to take the tarps down just before winter weather hits. You are really only trying to provide shade during the hot summer months. Let’s say you want to install a shade tarp to park your truck under during your two-week summer vacation. Some truckers do this to prevent excessive heat buildup while they are away. In either case, you need to get the tarp up high enough to accommodate the height of your tractor. Tent poles are probably not going to be suitable for this situation. The easiest way to accomplish this idea, is to string the tarp between trees or building structures on your property. Just tie a rope to each of the four corners and away you go. The only tricky component to this installation is determining the right tie down locations without having to run ropes too far. The longer the ropes, the more difficult it will be to maintain good tension. A suggestion is to pull your truck up next to a garage or barn with trees nearby. You could attach one end of the tarp to the structure and the other ends to a couple of trees. The second method of installation is one that campers use all the time for erecting tarps above their tents. It is known as A-frame installation because you are creating a shape similar to an A-frame house. It is simple to do, so it’s pretty effective for a lot of different uses. To begin with, string a piece of rope between two trees or structures near the area you want shaded. Next, lay the tarp over the rope exactly where you want it. Finally, secure the tarp with additional ropes and stakes driven into the ground. You now have an A-frame shade structure that you can sit under, park your bicycles under, etc. To create a shaded sitting area, there is no better installation than the 4-pole installation. For this installation, you just need four tent poles, a sturdy rope, and a few stakes. You can make your own tent poles pretty easily if you don’t already own them. Installation is a simple matter of placing a tent pole at each of the four corners, attaching a rope to each pole, then pulling the ropes till they are taut and staking them down. For extra structural integrity, you can add more poles around the perimeter or just stake the tarp directly to the ground with rope. The beauty of this installation is that you can set the height of your shade tarp as you desire. If you want it higher, you can go as high as your tent poles allow. Shade tarps make great temporary shelters from the hot, summer sun. 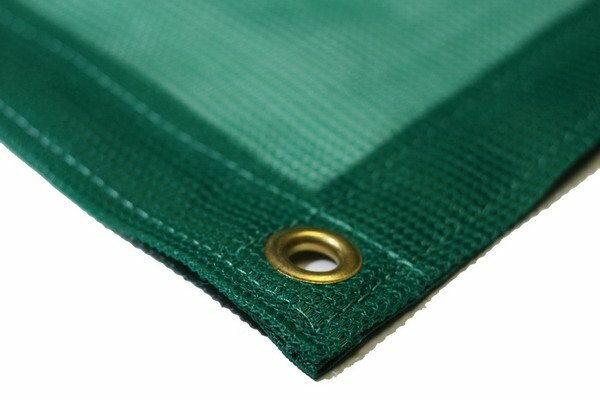 Mytee Products is happy to carry both black and green shade tarps in nearly a dozen different sizes.